On An Overgrown Path: Last fight of the Proms? Last fight of the Proms? A possible strike by BBC staff over pay and pensions threatens the Prom on Sept 9. To counter the threat the BBC senior management trots out its talking heads. Which means BBC Radio 3 controller and Proms director Roger Wright is taken for a quick canter through the standard defence of his annual £215,322 salary and £16,405 personal expenses in today's Guardian. The Guardian is, of course, resolutely pro-BBC management. As one would expect from a paper whose classical music critic splits his time between the paper and Radio 3. When the Guardian gave Roger Wright a platform to set out the party line in July a BBC staff member emailed me describing the station controller as an apparatchik. That is just one of many similar emails I have received from within the BBC. They all express support for the views on Radio 3 published here and confirm what the RAJAR figures and listeners are saying; there is something rotten in the state of Langham Place. But the dissenting emails also all ask for the views of the BBC staff who write them to be 'off the record' and I, of course, respect those requests. But now that the discontent of rank and file BBC staff over pay and pensions is out in the open, isn't it time that internal discontent over creative policies is made public in the same way? * Header photo shows classical musicians making a very public statement of discontent. It was taken on the picket line at the time of the 1980 dispute between the BBC management and Musicians Union over plans to disband the BBC Scottish Symphony Orchestra; a dispute which, thankfully, the musicians won. Read the full story here. Your reminder of the 1980 strike by the BBC Orchestras is apt as we are remembering it 30 years on with a photo exhibition at the Musicians' Union AGM here in Glasgow on Sunday. 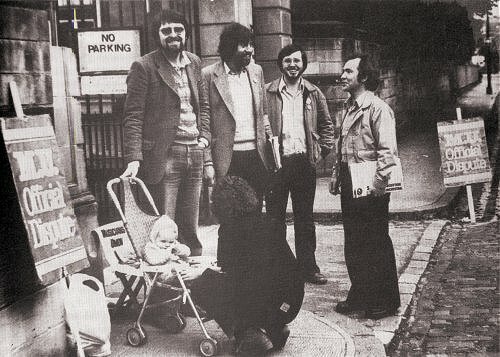 The photo shows mainly composers on the picket line: Bill Sweeney, John Laughland, John Grant (flautist) and Eddie McGuire; with Bill's son Michael and his wife Anna in front. Michael now works for the MU in London! Photo was taken by Des McGuire.